Pulling The Curtain Back On NPR's Election Coverage : NPR Public Editor Readers and listeners complain about bias in individual segments of NPR's coverage, but Managing Editor David Sweeney says overall balance in the aggregate is what counts. We listened to a morning news meeting to see how the NPR sausage gets made. During the morning news meeting Thursday, attendees decided Gov. 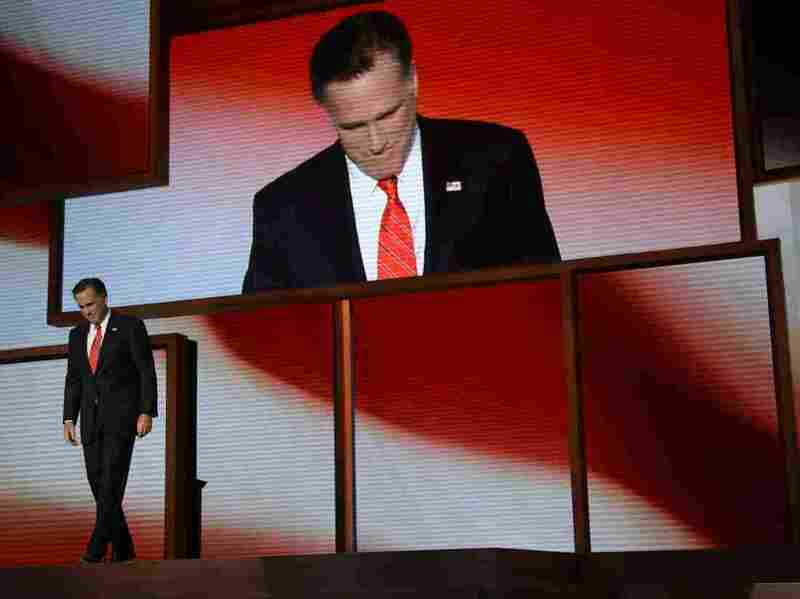 Mitt Romney's speech at the 2012 Republican National Convention was the top story of the day. As the countdown to Election Day continues, we're hearing from more of you with complaints about campaign coverage and bias. Emails and phone calls express concern that one party or another is under-represented and that NPR reporters are "cheerleading" for candidates. "It seems to me that the great majority of people you interview are Romney supporters," Pemala Mejia from Castro Valley, CA wrote. "I get the uneasy impression that this is a program doing subtle campaigning." But listener Kevin Baker from Arlington, VA had the exact opposite experience. "Every Democrat interviewee recorded is universally positive about Obama with no challenges offered from the interviewer. Everything is taken at face value," Baker wrote. I took these complaints and others to Managing Editor David Sweeney. I asked what guidelines or procedures were being followed in the campaign coverage to assure accuracy, fairness and impartiality in the coverage of the two parties and their many November candidates, beginning with President Barack Obama and Gov. Mitt Romney. The good news is that I came away with answers; the bad news is that they probably won't leave many satisfied. Neither balance nor bias is easily measured. Hard numbers are difficult to come by. But Sweeney did share the principles that guide the newsroom's coverage of politics and the election. They began with looking at that aggregate of coverage – and not a single story—in judging balance and fairness, Sweeney said. "If people listen at a particular moment they may not be aware of everything that has gone before and everything that comes after," he said. "It's not as if NPR is a monolithic broadcasting and digital structure. There are many streams of coverage coming out of here." A listener may feel frustrated by a segment they hear on the air and that one story may well be representative of just one side. But Sweeney says that if you look at the full package--all of the segments on air, the Web stories and blogs--the reporters and editors working under him, as well as the producers of the shows, are trying to paint a full picture of the candidates and parties. "We make a determined effort to be fair, accurate and representative of the campaigns. The only agenda we have is to cover the news and be as accurate as we can," he said. When asked if there's any kind of formal checks and balances system in place when deciding coverage, the answer was no. But Sweeney believes that the there's an organic one at work in the newsroom. "There are enough editors in this building to challenge everything that we say," Sweeney said. "There's a pretty diverse group of editors and reporters in this network that will speak up if they don't think we're covering a story well. Also, we take note of what listeners and online readers are saying." To prove his point, he invited me to anonymously call-in to a morning news meeting that he runs. At the daily gathering–which is also a conference call for people on the road or not in the office–senior desk editors, show producers and news leadership discuss the top stories of the day. They decide how those stories will be covered by newscasts, Tell Me More, Talk of the Nation, All Things Considered, the following day's Morning Edition, as well as by bloggers and online media. I found a robust conversation, as Sweeney promised. It was Thursday and Gov. Romney's acceptance speech at the Republican National Convention was the top story of the day. One editor reported that correspondent Ari Shapiro would file a segment for that evening's All Things Considered. Another said that Mara Liasson, who had filed an eight-minute story that morning, was preparing another one for Friday's Morning Edition. And someone else suggested an update on Ron Paul. The conversation continued and was low key and factual--a divvying up of responsibilities and ideas. No one knew that I was on the line, but I didn't hear any endorsements, criticisms or diatribes. No one mentioned filing a story about the Democratic Party, but it was the last day of the Republican National Convention. It will be the Democratic Party's time in the sun next week during their convention. Even so, Scott Horsely filed a four-minute segment for Friday's Morning Edition about President Obama's visits to college campuses. NPR has about 60 people working to cover the campaigns, in addition to member station reporters and specialist correspondents--such as science or economy reporters--who might cover an issue-oriented campaign story related to their beat. "Right now until Election Day we have a correspondent traveling with both presidential candidates," Sweeney said. "It means we are on the campaign trail, on the bus, on the plane. We are one of a small group of media organizations committed to covering the campaign in-depth like this." In addition to following the candidates, NPR's First and Main series features individual American voters. These segments, however, are not always well received by all listeners. "Why devote 10 minutes to the views of one person, without any attempt to provide balance or another perspective?" Richard Kaukas from Louisville, KY wrote after hearing David Greene's nine-minute interview with restaurant-owner Linda Wendt from Winnebago County, WI. Wendt told Greene that she's not planning to vote for President Obama in November. Once again, Sweeney said, the balance is in the aggregate and one interview does not throw off the total balance of the organization. In addition, he said hearing from voters is valuable. "It's the voters who ultimately decide this election, not journalists, not politicians. We use every opportunity to get out and hear from people," he said. Despite the fact that there are a lot of races and candidates, the news staff's main focus is on the presidential race and the Republican and Democratic candidates. That's unsettling to someone like Jason Burguess from Eugene, OR. "Your election coverage is great except for one thing: you're missing a candidate: Green party nominee Jill Stein. With millions of Americans frustrated with the failings of a two party system, she is a refreshing new voice," he wrote. There has been some coverage of Stein on NPR, but certainly not equal to the coverage of President Obama or Gov. Romney. "We can't give all candidates equal air time," Sweeney said. "We don't have the resources to cover every one of them. We have to prioritize. We look to cover as broad a range of views and perspectives as possible. For example, in addition to the Democrats and Republicans, we covered the Green and Libertarian Party conventions and interviewed both their nominees." That being said, Sweeney said NPR tries to offer a variety of coverage--both hard and soft news--to fully capture the 2012 election season. And there are some changes to this year's coverage. "We made a conscious decision to do more truth-squading reporting of our own. And we also continue to work with PolitiFact and other organizations," Sweeney said. There has been growing public demand for quicker fact-checking from the news media overall, in part because of the now 24-hour news cycle. As Joanne Ostrow from the Denver Post wrote, "The media's fact-checking function has been standard for generations but it's just now become mandatory in as close to real time as possible," citing a report by Mara Liasson about Paul Ryan's speech as an example. Some listeners take the fact checking as disrespect or bias when it concerns their candidate; others take an inability to fact check on some statements on deadline as laziness or a reverse bias. Reporters and editors say they are simply trying to be as accurate as possible, as quickly as possible. In the coming weeks, we'll continue to follow NPR's election coverage and investigate your concerns. Please let us know if there are additional points you think we should consider or investigate in this office. In doing so, we do ask that you consider the aggregate. Some segments may indeed be representative of one particular side--allowing the full expression of a point of view is important—but that does not mean the total coverage is unbalanced. Still, it's important that we all be alert to make NPR's coverage the best and most impartial that it can be. Lori Grisham is the assistant to ombudsman. She holds an M.A. in journalism from American University in Washington, D.C.